The period of the Italian Renaissance is the greatest in the history of European art. 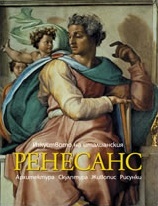 The book is a dazzling journey through four centuries of Italian Renaissance painting, sculpture, and architecture. Its sumptuous color illustrations, fine writing, and in-depth scholarship bring into focus all the elements of this extraordinarily creative period and the remarkable personalities who gave it life. The translater: A Model Reader?